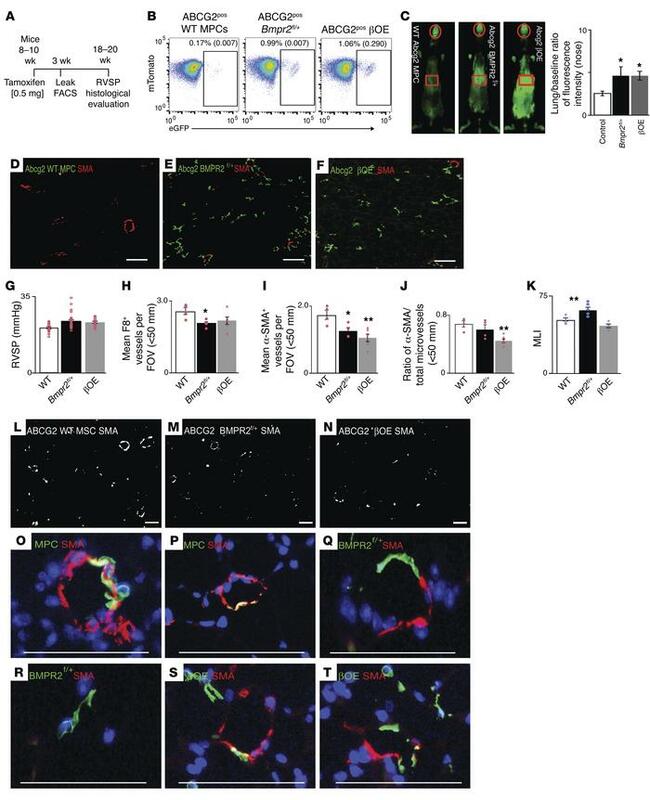 Abnormal pericyte lineage specification and microvascular dysfunction accompanied by loss of distal lung tissue structure in vivo via deregulation of BMPR2 and Wnt/β-catenin signaling in lung MPCs. (A) Schematic time line of mouse modeling. WT, Bmpr2fl/+, and βOE mice were induced with i.p. tamoxifen (0.5 mg total). (B) Two weeks after induction, eGFP labeling and enumeration of ABCG2+ lung MPCs were confirmed by flow cytometry (n = 3–6). Numbers in parentheses represent SEM. (C) Three weeks after induction, pulmonary vascular leak was quantitated. Representative images of mice obtained with the Pearl analyzer. Bar graph shows the ratio calculated for each animal, comparing the intensity of dye in the lung (red squares) with the baseline fluorescence in the nose (red circles) (n = 7–15). (D–F) Additional mice were sacrificed and the lungs agarose inflated using constant pressure to obtain lung tissue for immunofluorescence analyses. Immunostaining for detection of eGFP (green) MPCs and derivatives as well as α-SMA (red) was performed (n = 4). (G) Eighteen to twenty weeks after tamoxifen induction, RVSP was measured (n = 10–13). Immunostaining was performed on lung tissue sections to detect (H) F8+ microvessels and (I) α-SMA+ muscularized vessels. (J) The ratio of α-SMA/total microvessels was also calculated, and the positive numbers were counted per FOV. Six to eight sections of twenty FOV per section were evaluated (n = 4). (K) MLI was calculated to evaluate the loss of distal lung tissue structure (n = 6). (L–N) Immunofluorescent staining (IFC) to detect α-SMA demonstrated a decrease in α-SMA overall in Bmpr2fl/+ and βOE lungs. (L–T) Immunostaining was performed to detect ABCG2+ MPCs and derived eGFP- and α-SMA–expressing cells. Scale bars: 50 μm (L–T) and 100 μm (D–F). Data are presented as the mean ± SEM. *P < 0.05 and **P < 0.01, by 1-way ANOVA followed by Tukey’s honest significant difference (HSD) post-hoc test.